Milledgeville, GA- It’s beginning to look a lot like Christmas in downtown Milledgeville as preparations are made for city-wide yuletide beginning with First Friday on December 1st from 6-8pm and the annual Exchange Club Christmas Parade on December 2nd. The holiday season is underway and there is no better place to get shopping done than historic downtown Milledgeville. Along with old favorites, downtown has several new shops with great gift options. Shop small this First Friday. 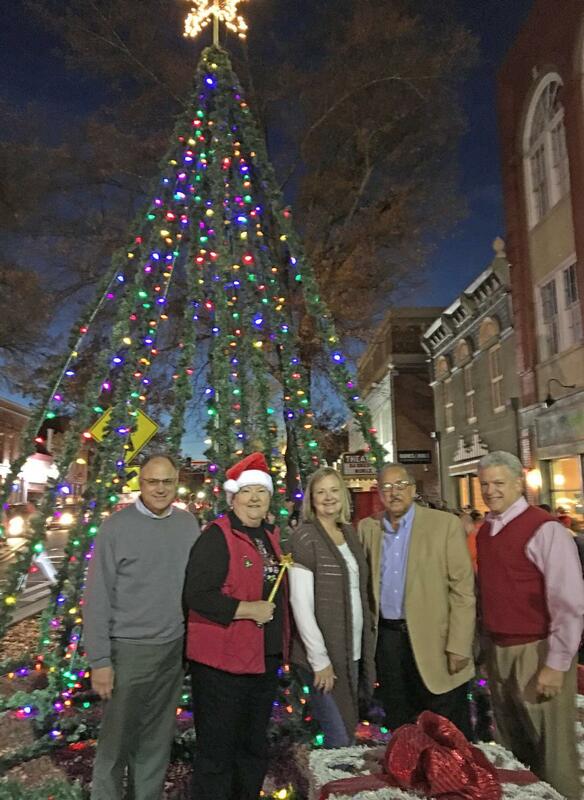 The Milledgeville Pilot Club has partnered with the City of Milledgeville and Fowler Flemister to host the annual Christmas Tree Lighting. The tree lighting will take place at 6:00pm on West Hancock Street in front of The Local Yolkal Cafe. Immediately following the Christmas tree lighting, Santa Claus will make his grand entrance on the fire truck around 6:15pm. Children are invited to visit with Santa inside of The Local Yolkal Cafe and enjoy complimentary hot chocolate and cookies. Stroll the downtown sidewalks and listen to Sweet Georgia Sound, a diverse group of skilled singers that will provide entertaining performances and enhance the holiday spirit with popular holiday tunes while they carol downtown. At 6:30pm the Vibe Dance Center will give a sneak peek of their take on the "Night before Christmas". A favorite Christmas classic told through various styles of dance. The performance will feature children ages 2-18 and showcase hip hop, jazz, tap, ballet, and contemporary styles. Catch the full performance on December 15th at 7pm and December 16th at 3pm & 7pm in Russell Auditorium. Champion First Friday Sponsor, Magnolia State Bank (MSB), will have magic scratch ornaments for the kiddos and a chance to win MSB goodies. The Milledgeville Jaycee’s, Alpha Psi Omega and Nash’s BARC will provide fa-la-la-la fun activities for the kiddos and Lisa Marie will be back with festive face painting! Special thanks to our wonderful Champion First Friday Sponsors Robins Financial Credit Union and Magnolia State Bank. There are many people and organizations that help to bring the magic of Christmas to downtown, such as: The Pilot Club, Fowler Flemister, The Local Yolkal Café, the Milledgeville Jaycee’s, Noah’s BARC and Alpha Psi Omega, as well as the City of Milledgeville Public Works department for the hard work putting up all the decorations! Milledgeville Main Street by phone at 478-414-4014 or by email dthornton@milledgevillega.us.